Why does it take death to bring us together? Why not life? Watching Nancy Reagan's funeral on television, the front-row tableau was a picture of unity, in form, if not in substance. There was Gov. Jerry Brown of California, a Democrat, Michelle Obama (D), former President George Bush (R), Laura Bush (R), Hillary Clinton (D), Rosalyn Carter (D) and Caroline Kennedy (D). Democrats and Republicans sat together in common purpose, if not on common ground. Former ABC News anchor Diane Sawyer observed this about Mrs. Reagan: "She didn't harden differences into definitions." What a contrast to what passes for political dialogue today, which is too often crass, injurious and mean. And defining. And hardening. If we look on the beauty of such moments -- and we should as on a glorious spring day -- why can't we have political discourse that is -- to borrow a phrase from Ronald Reagan's successor, George H.W. Bush -- kinder and gentler? Largely it is because the quest for power and influence over others is born of lust and lust rarely leads to much that is good, more often it leads to self-destruction. 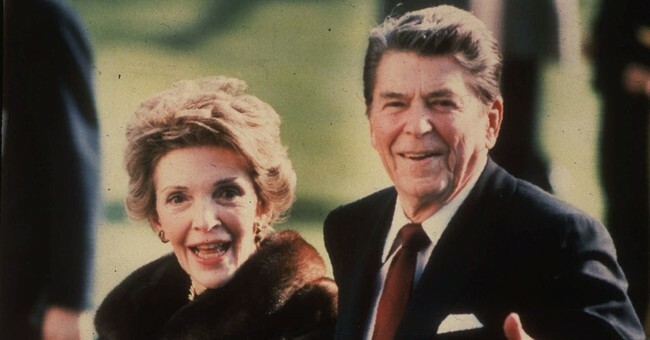 Former Canadian Prime Minister Brian Mulroney read a letter President Reagan wrote to Nancy on their first Christmas in the White House in 1981. It is so full of love that probably no man on Earth could live up to its standard. Look it up if you didn't hear Mulroney read it. Former Reagan Chief of Staff James Baker said Nancy kept all of her husband's many love letters in a paper bag in a closet. He kept her in his heart wherever he was and whatever he was doing. At funerals we forget all of the mean things some of us say about each other. "Don't speak ill of the dead" is one familiar admonition. How about not speaking ill of the living, or at least refrain from questioning motives, character and patriotism? We can and should debate the wisdom of policies, but not the love any of us have for America. What would our politics look like if we adopted such an attitude not just at funerals, but throughout life? Yes, I know, it's too much to expect. It wasn't long before many of those at the funeral who are still politically active were back at it and at each other. But for one brief, shining moment, we saw what America looks like when we speak and act well of one another. It is something beautiful, something good. I wonder how we might behave if we thought of our own funerals, which await all of us? Would we be kinder to those who might speak at our service? What would we want them to think and say about us? If it is nice things, what are we doing now to improve the chances that their remarks and thoughts will be pleasant? On Nancy with the laughing face. That's Nancy with the laughing face."